What could be better than being able to take pictures underwater while on a scuba dive? How about having your hands completely free and still being able to take amazing pictures? While it may sound too good to be true, that’s exactly what the liquid image camera mask is claiming to offer. I was a little skeptical myself but after a couple of trial runs I must admit that my skepticism quickly became enthusiasm. This handy little camera is the only one in the world like it. For those who may not be so tech savvy, “HD” implies that the camera is capable of high definition picture and video. This one is truly top of the line at 720 pixels and a video recording capability of 30 frames per second. The camera also features a wide angle lens, which if you have done your homework, you know is an absolute must for underwater pictures. Without this feature your pictures would all appear murky and the objects you were photographing would be blurry and indistinct. Liquid Image really thought of everything when they designed this mask. 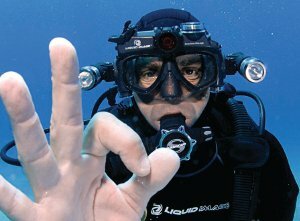 It’s always a concern with any underwater equipment whether you will be able to properly function everything while wearing diving gloves. This camera mask made sure that was no issue. Rather than buttons, the controls on this camera are lever-style and easily accessible; no matter how big your hands may be, you will be able to function these with no problem. As if the standard features were not enough this camera mask also has a few extras that are a definite bonus. First off is the slot for a Micro SD card; this allows you to add up to 32 GB more memory to your camera. More memory equals more pictures and video- a huge bonus for a diver who obviously cannot scan through and transfer files while underwater. 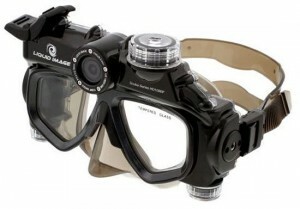 Another great feature is the light attachment- perfect for those dives where visibility is limited. One thing to note; the attachment is included, but the light is sold separately. It’s a good investment to make if you decide to buy this camera mask and only costs about an additional $50 or $60. As an added bonus, there is a USB cable included so you can download your pictures and videos from your camera instantly. Within seconds they are ready to e-mail, print, or just save to free up memory space on the camera. It also comes with a carrying case which is always handy for carrying it around between dives and storing it away when the adventure is over. At about $275, this camera is a bargain for all the features it offers-not to mention the fact that it is so user friendly. You do not have to be a technical genius to operate the camera mask, and underwater use is a snap. Imagine not having to carry around a camera- any diver knows that having your hands free is priceless. Now your hands are free, you have one less piece of equipment to worry about, and you are logging your trip with stunning photos and videos that you can share for years to come. While it is a slight investment and there probably are less expensive knock-offs out there, this camera mask will not disappoint and will leave you with pictures that are unique and invaluable. And really, you can’t put a price on memories. This entry was posted in Masks, Reviews, Scuba Diving, Underwater Cameras and tagged Camera, Liquid Image Wide Angle Scuba Series HD Camera Mask, Scuba Mask, Underwater Camera. Bookmark the permalink.